This story is the first installment of a three-part series focusing on the challenges and solutions for affordable housing in Boulder, Montana. It was written by the Boulder Monitor and is published here as part of The Montana Gap project, produced in partnership with the Solutions Journalism Network. Read part two and part three here. When the Montana legislature decided in 2015 that the Montana Developmental Center would close within two years, it was a blow to the community of Boulder. Drew Dawson, chair of the Boulder Transition Advisory Committee (BTAC), says the community did not reel for long, though, before buckling down to figure out how to bounce back. “Boulder is resilient and pragmatic,” says Dawson. Citizens gathered to begin “the methodical process of charting Boulder’s future,” he says. BTAC, aided by the local city and county government plus the county’s economic development arm known as the Jefferson Local Development Corporation, opened a community-wide study circle process under the label “Making Boulder’s Future Bright.” A kick-off gathering facilitated by Dan Clark of the MSU Local Government Center in March 2016 attracted over 100 local citizens. For about six weeks after that, the citizens met in small groups, discussing what they liked about the community, what they disliked, what they wanted to keep, what they wanted to change, and how to go about it. Four committees formed out of those study circles: marketing; attracting and retaining businesses; recreation; and repurposing the MDC buildings. Overseen by BTAC, that work has continued. From that work came ten goals and strategies for implementing those goals. Among other items, the goals cover downtown revitalization, marketing the community, developing affordable workforce housing to attract those priced out of the housing market in the larger nearby communities, and expanding growth options by extending city utilities. One major accomplishment that came from the citizen efforts was the successful passage of legislation to establish a $500,000 Boulder Development Fund. A citizen board has been appointed to oversee the usage of those funds. Other concrete accomplishments in process include the creation of a community Master Plan, the appointment of a city planning board, application opportunities for an affordable housing development, the development of a capital improvement plan for the city and the start of a downtown growth policy. Efforts are also underway to establish targeted economic districts. In October the community learned it had been awarded a $20,000 Montana Main Street planning grant for a Downtown Master Plan. “Being a Boulder downtown business owner, I’m very excited to see this happen,” said Cory Kirsch, owner of the local hardware store and a Jefferson County Commissioner. Business owners have been meeting with others in the community to fashion plans focused on the town’s commercial district. Ideas discussed have included removing false facades added to some of the historic brick buildings, restoring a wrap-around balcony on the second story of a 125-plus year old hotel, and encouraging the development of second story living quarters in some underutilized buildings. As part of the “Making Boulder’s Future Bright” effort, community members organized a trip to Philipsburg to talk with residents there about how their community has changed and what prompted that change. Philipsburg was chosen because it was viewed as having come back from being mining dependent to attracting an influx of tourists that lifted the local economy. Old-fashioned lamp posts, lots of flowers and specialty shops attractive to tourists add to the charm of Philipsburg. With an aggressive advertising campaign, Philipsburg had revitalized many of its downtown buildings, brought in a summer theater program, a brewery, a candy shop, a sapphire shop, a barbecue and other businesses attractive to tourists. Community leaders were also very aggressive about bragging about their community and getting others to do so, too. In 2002, when the revitalization was just getting underway, Philipsburg hosted a dinner for the Montana Newspaper Association, showing off what the town had to offer and predicting how great it was going to become. In October 2017, the Philipsburg Arts Fund was awarded a $12,500 grant from the Greater Montana Foundation to fund a 30-minute documentary called “Saving the Burg.” The documentary will highlight how the community revitalized its economy. 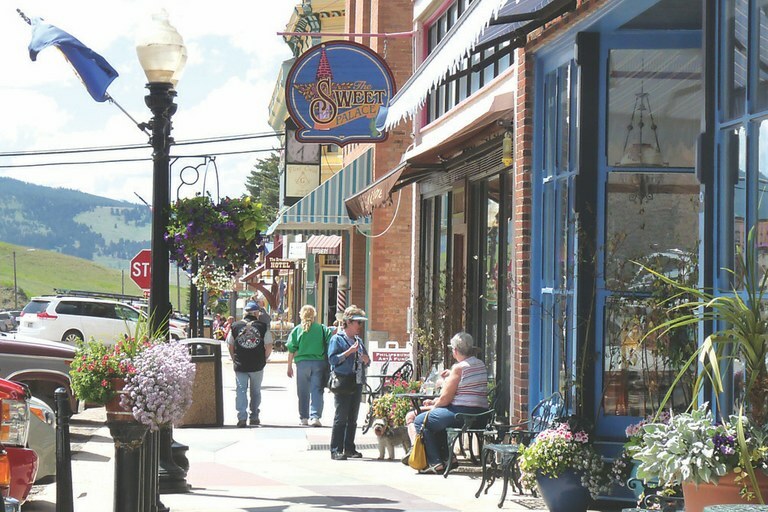 According to 2015 federal statistics compiled by Headwaters Economics, Philipsburg has about half the population of Boulder but more than twice as many individuals in retail trade. The percentage of Philipsburg’s population in retail and wholesale trade is more than five times the percentage in Boulder. Boulder’s percentage of population below the poverty level at 23.2 is more than twice that of Philipsburg’s at 11.7. The per capita income in Philipsburg in 2015 was $25,788, nearly $6000 more than Boulder’s per capita income of $18,845. Those who made the trip to Philipsburg, among them Connie Grenz, returned with advice. “Boulder needs to know what is special about its particular area, its history and location, and tell the story of why people should come.” Failure to do that will allow naysayers to win, Grenz said. The Sayrs building in Philipsburg gets some fresh paint on its lower level. The building is one of many in the community that helped it earned a “prettiest painted town” award. Other advice Grenz shared: find a banker with vision to support the effort; see the opportunities and be willing to take risks; advertise widely in all sorts of media; create a promotional website that works on a wide range of devices; take advantage of serendipity. 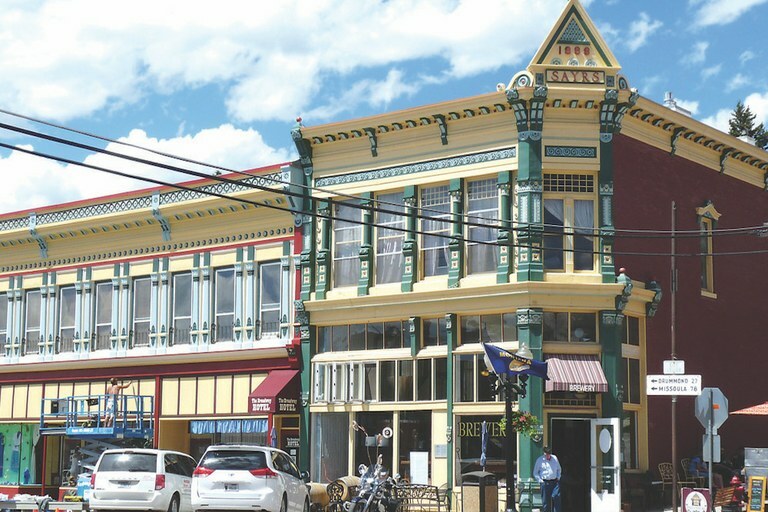 Philipsburg entered a paint company contest that led to its declaration as a “prettiest painted town,” something that led to media coverage and became a bragging point in marketing the town; and know that enthusiasm can be contagious, but inertia is powerful. While Boulder is really just at the beginning of the real work to rescue the town, one problem it appears to have overcome is “getting people off the couch.” According to the town’s Montana Main Street grant application, “over 21, 278 collective hours, or 10.2 years of volunteer investment, have moved Boulder” forward. “I think we are well positioned to do what we need to,” said Kirsch, a local business owner and county commissioner.